Window Sill Maintenance is probably not the first thing to mind with any property owner making a maintenance to-do list, but caring for you window sills is an essential part of your property maintenance plan. These three “watch-outs” could save you from some potentially expensive repairs. Before undertaking any window sill maintenance, consider that the primary function of a window sill is to protect the wall beneath from the damage that could be caused by exposure to rainwater falling from the window. Any properly designed window sill should have an adequate incline to direct rainwater away from the window and to prevent it pooling on the sill and seeping into the wall below. Any surface damage, including flacking paint, can interrupt the water flow and allow damage potential to build over time. Ensure that the surface of the sill allows for a smooth uninterrupted flow. If the sill has any damaged paintwork, ensure that you remove flaking paint and bring surface back to a relatively smooth finish before repainting. This may require a bit of qualified judgement, so if necessary, call on the services of a construction professional. What you’re looking for in this is any signs that the window sill itself has suffered damage, for example a crack in the window sill that could allow water to seep through and penetrate down into the structure of the wall beneath. Similarly, any degradation of the mortar around the sill could also allow potentially costly damage. 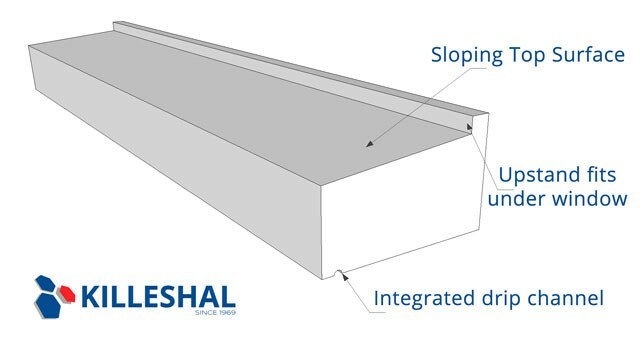 Although precast concrete sills would be more durable than wooden sills, even concrete sills can suffer damage. Some minor knocks or cracks can be repaired with products like MatchCrete, available from us here at KPC (click for more on MatchCrete), but if you have any doubts about the integrity of your window sill or the mortar around it you should consult a construction professional. At worst, you might need to replace your sill, but this window sill maintenance option could be far more attractive for you than coping with a compromised structural wall. The drip channel is a simple but clever little addition in window sills. By design, the inclined top surface of a window sill takes water away from the window and directs it down over the outer face of the sill where it should fall to ground. However, there is a tendency for some water to creep in along the underside of the window sill towards the wall where it could do as much damage as it would if did not have to circumnavigate the sill at all. To prevent this, sills are designed with an integrated drip channel that is set back just a little from the front outer face of the sill. This channel presents a vertical climb to the creeping rain water, which it cannot make, so the rainwater is instead shed off the window sill and falls to ground as desired. Over time, especially with multiple layers of paintwork, this channel can become blocked or ineffective through being too shallow. Ensuring these drip channels are clear should definitely be a part of your window sill maintenance; all it should take is a quick run over with a wire brush to clean out the channel and maintain its effectiveness as a barrier to water creeping in towards the wall surface. To finish, it would be a worthwhile endeavour to set yourself an annual plan of checks for your property and to include the steps above to ensure that your sills are in good condition and performing as they should. Ideally, this should be before the autumn rains and winter frost. A useful aid for this would be to set a reminder on any of the cloud based options like the calendar services provided by Google, Apple or Microsoft amongst others. If the worst comes to the worst and you find your property in need of replacement sills, don’t forget that KPC stock one of the widest ranges of precast concrete window sills, not just in the UK and Ireland, but across the whole of Europe.